Calling out all fellow Yogis! Your search for that Perfect Yoga towel is finally over! Here is what you can expect from THE VITA BEATA Hot Yoga Towel! -24"x72" and 380gsm, the Perfect Size specially created to fit most yoga mats in the market. -Zipper Pocket, 15x20 cm, meticulously designed to store your personal essentials during yoga practices. -Skid less, Non-Slip and Super Absorbent are made possible by our 100% premium microfiber material. Perfect for Bikram, Hot yoga, Ashtanga yoga, Vinyasa and Power yoga where TVB yoga towel can absorb more than 5 times its weight of liquid! Moreover, you will realise your grip increases significantly when the towel starts to get damp, propelling the skid less and non-slip feature to its full potential! As it now grips the mat and provides excellent traction for your hands and feet, you can now focus on your poses and breathing instead of busy adjusting your bunched-up towel every now and then. -Special reinforced whip stitching not only gives the towel maximum lifespan, it also makes it more attractive. With TVB yoga towel, you will definitely be the envy of many in the studio. -Multi-purpose towel for uses apart from yoga, like as a bath or beach towel, sports and outdoor exercise. -Classic packaging makes it a hassle free and Perfect Gift for any occasions. -By creating a layer between you and the mat, it aids Personal Hygiene and also reduces the risk of harmful bacteria spreading to your skin, especially when you are using a shared mat provided in studios. -Too tired to do the laundry after a workout? TVB Hot Yoga Towel is Machine Washable, with tumble dry on low setting, its Easy Maintenance makes it all fuss free! -Click on the "ADD TO CART" now for you and your loved ones with all orders being backed by a 100% money back guarantee!  SKIDLESS & NON-SLIP - You will be able to hold your poses like a true yoga Pro! It works best in Hot yoga and Bikram classes where a dampened towel makes it skid-less and gives you optimal grip.  PREMIUM DESIGN & QUALITY - Highly durable microfiber, coupled with reinforced whip stitching, giving the towel maximum lifespan. The Color is laboriously coordinated to give its best look possible and a Meticulously designed zipper pocket to store your personal essentials during classes. 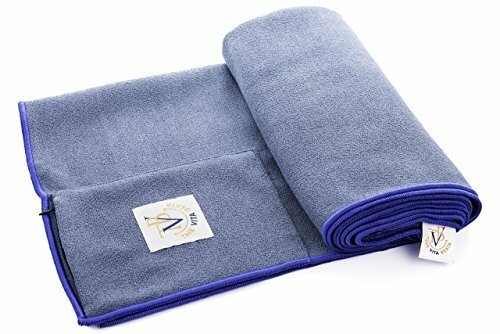  IMPROVES PERSONAL HYGIENE & PROLONGS MAT LIFE - Bring TVB yoga towel for your yoga classes and you may now use the in-house studio mats at ease. TVB machine washable yoga towel not only adds as a hygienic layer between the studio mat and you, it also reduces the risk of harmful bacteria spreading to your skin and saves precious time to maintain mat cleanliness.  SUPER ABSORBENT & QUICK DRYING - TVB yoga towel easily outperforms any other ordinary cotton and polyester towels. It is made of 100% lightweight, moisture wicking microfiber and is able to hold up to 5 times its weight of liquid. Moreover, it dries in half the time required of normal towels!  PERFECT GIFT and 6 STAR CUSTOMER SERVICE - Unlike most yoga towels that are only shrink or paper wrapped, TVB yoga towel is housed in a premium gift box which makes it the number 1 gift for any occasion! CLICK on the "Add to Cart" now! We offer 6 star customer service and your purchase is backed by a 100% money back guarantee! If you have any questions about this product by The Vita Beata, contact us by completing and submitting the form below. If you are looking for a specif part number, please include it with your message.